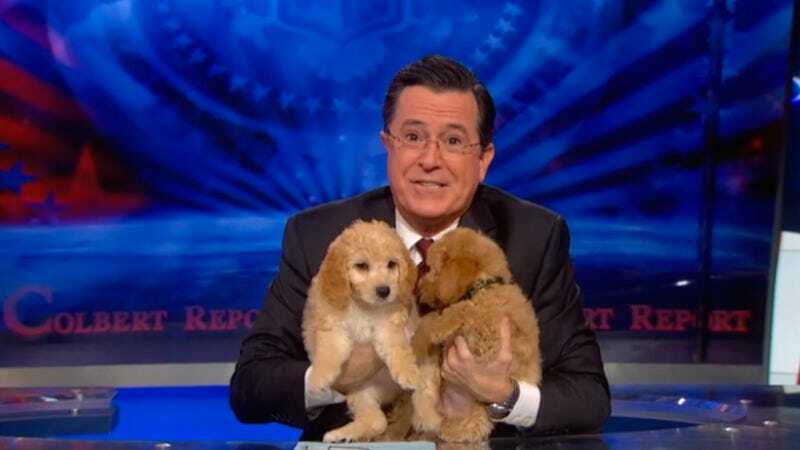 Now that he’s free of his conservative alter ego Stephen Colbert, Stephen Colbert is free to act like the bleeding-heart, public-school-loving liberal he really is. (The other Stephen Colbert presumably believes in shutting down public schools and letting students fight for spots at private ones in gladiator-style fighting pits.) Case in point: according to The Associated Press, Colbert surprised teachers in his native South Carolina today by announcing that he would fund every single classroom project listed by teachers from the state on the crowdfunding website DonorsChoose.org, a gift valued in excess of $800,000. Funds for the donation will come from the sale of Colbert’s desk and fireplace from The Colbert Report—which were raffled off online late last year—with matching funds from ScanSource and The Morgridge Family Foundation’s Share Fair Nation. Colbert, who is a member of the DonorsChoose.org board, made the announcement on a live video feed to the students of Alexander Elementary School in Greenville, South Carolina earlier this morning. The money will fund nearly 1,000 projects submitted by teachers at 375 South Carolina public schools, and will pay for things like books, classroom improvements, and new technology.